Who would have thought that January sales can be about other things than clothing? All my favourite kitchen stores were having huge sales, and so I purchased two things that are otherwise always extra-expensive but now they were down to quarter price. First of all, I got a pestle and mortar, because I’ve had my eyes on those things for a long time – but they’re always priced around at least £30-£40. This time though, I got a heavy granite stone pestle and mortar set for £13.50, which is rather impressive. I could kill a man with that thing. The griddle pan especially comes in handy now as weirdly enough, I actually started a diet. Just a light one, with lots of green tea, vegetables, granola, brown rice and wholemeal; honestly, I saw the Christmas pictures taken of me and I had the motivation. I’m also starting to exercise, little by little, mostly at home. But when I’m ready, I swear I’ll return to the gym. So this is actually a recipe I came up with by myself , so I felt pretty good about it. I had just the right amount of cubed leg of lamb left over, and the best part is that cooking this actually takes about 20 minutes tops. In this spicy mixture, I let the lamb sit for about 2 hours until it soaked up everything. I also soaked my chopsticks into water at the same time (prevents them from burning). 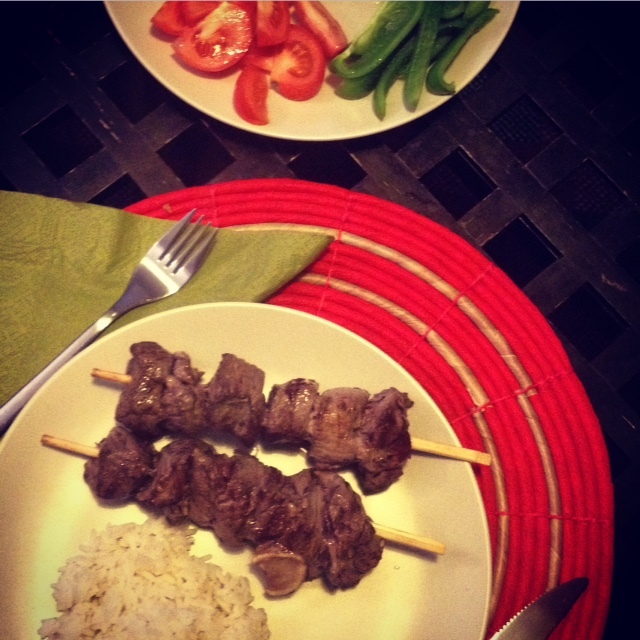 And yes, chopsticks, I was too lazy to leave the house and get skewers so I had to get creative. 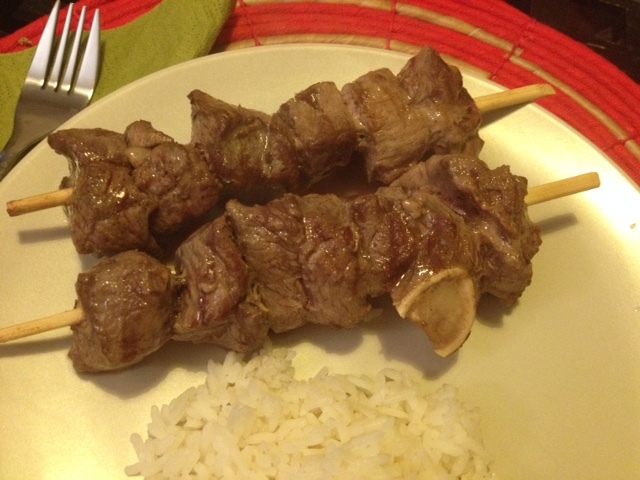 Anyway, having marinated, just pierce the meat and make good-looking skewers out of it. Heat the griddle pan with a touch of vegetable oil until practically smoking. Put in your lamb and fry until you get those beautiful stripes on all sides (I love those). Now comes the exciting part: I only aimed for searing, so colour – afterwards, I could just take the pan and put it into a 200 degree oven with a grill function set to medium-high and let the oven finish off the rest. When it came out, it was just slightly pink on the inside and incredibly juicy. I served these with some plain rice and sliced vegetables, and they made an incredible meal. The taste and smell of the spices on the meat made this special, and yet it is perfect for any other night. I was so happy with this. This entry was posted in Blog, Main meals and tagged cooking, delicious, easy, food, frying pan, grill, healthy, ingredient, lamb, marinade, meal, meat, quick, recipe. Bookmark the permalink.